For winners of the 2018 Art Competition, please click here. The Festival Committee will soon be seeking artwork to be considered for the cover of the 2019 Festival catalog, as well as various promotional items. The winning entry will receive a prize of $500 and the artist will have their bio and photograph featured in the 2019 Festival Catalog! The winning selection will be chosen by the Festival Committee, and winners will be announced and all submissions will be showcased at the Festival. In previous years, we have had a tremendous turn-out with a great showing of wonderful talent! The Deadline for artwork submissions will be midnight May 31, 2019. To submit your entry for the 2019 Art Contest online, please click here. 1. Art should be greyscale or black and white (preferably pen and ink). 2. Art must be no larger than 8”x11”. 3. 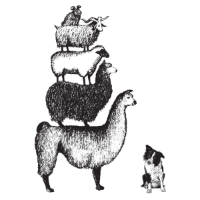 Art must reflect the theme of the festival by including one or all of the following: Fiber animals (sheep, goats, alpacas, rabbits, llamas, etc), working border collies, fiber tools (spinning wheels, weaving looms, knitting needles, etc), or items made of fiber (sweaters, blankets, mittens, etc). 4. Please do NOT include text in your design. 5. Winning artwork will become property of the Fall Fiber Festival & Sheep Dog Trials, Inc.
We thank you for your interest in the art competition and look forward to seeing you at the Festival in October!